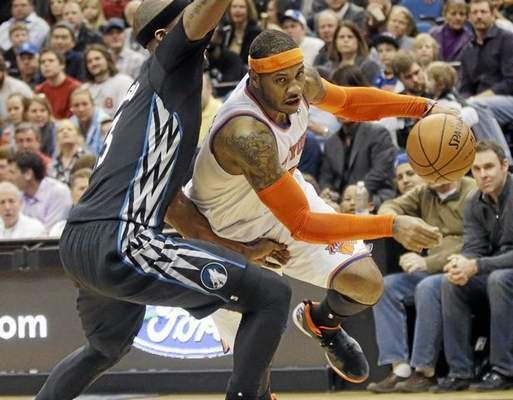 NBA free agency: Which team best suits Carmelo Anthony? The billboards plastered with his likeness welcomed Carmelo Anthony when he stepped foot in Chicago and Houston. Championship trophies and a Hollywood-produced film greeted Anthony when he walked into the Lakers’ facility. Anthony heard every sales pitch, whether it came from a persuasive owner (Dallas’ Mark Cuban) or a persuasive executive (New York’s Phil Jackson) or a persuasive friend (the Lakers’ Kobe Bryant). All of which leaves Anthony to answer one important question that will shape both his future and the NBA landscape. Which team will Anthony play for next season? Anthony would not provide much insight after leaving the Lakers’ practice facility last week. “You know I can’t say anything,” Anthony said with a smile as he rolled down the window of his red Rolls Royce. To help Anthony sort out every sales pitch and persisting concern, below are a list of pros and cons from each team he visited during free agency. Pro: Chicago could offer everything Anthony lacked during four frustrating seasons in New York. The Bulls have an elite ball handling point guard that could offer secondary scoring and crisp passes (Derrick Rose). The Bulls have a defensive minded coach (Tom Thibodeau). They have scrappy players that can provide all the hustle plays (Joakim Noah). That leaves Anthony with no little worry than to tap into what he does best: score and shoot a lot at a prolific rate. Con: Chicago lacks the cap flexibility to sign Anthony to a maximum-level contract. So it appears likely Chicago would either have to unload parts of its roster or facilitate a sign-and-trade. It appears doubtful the Knicks would become open in such a sign-and-trade since they want to keep Anthony. So that leaves Anthony potentially leaving for another team that gutted its roster simply to accommodate his arrival. Outlook: As currently constructed, Chicago has the best personnel to help Anthony pursue an NBA championship. Yet, question marks persist on whether Rose can stay healthy. Pro: The Rockets already provided visual evidence on what Anthony would look like in a No. 7 uniform, plastering photoshopped images of Anthony all over the city at the expense of his former arch nemesis, Jeremy Lin. But Anthony would look great in a Rockets uniform because he will have a solid supporting cast around him that will ease his offensive burden. James Harden will both handle the ball and create his own shot. Dwight Howard will dive off pick-and-rolls and throw down putbacks on any missed shot. All of those elements should create open shots for Anthony all over the court. Con: This mix could form into giant mess. Harden showed last season he does not always share the ball equally with Howard. Though Howard played out of his mind last season, he could not entice his supporting cast to play defense. And though the Rockets appear to be a fun group, they have not yet proven they have the mindset necessary to make a deep championship push. Outlook: The Rockets have a savvy combination of superstar talent and youth. But in a competitive Western Conference, it appears likely this group will need some time to grow before becoming a championship contender. Pro: The Mavericks won’t have to break up their team just to accommodate Anthony’s arrival. His future supporting cast would feature a speedy point guard (Monta Ellis), a consistently prolific wingman (Dirk Nowitzki) and a solid defender (Tyson Chandler). Mavericks owner Mark Cuban has also established a proven track record in ensuring his team has stayed playoff competitive in the last decade. Con: If Anthony wants a maximum contract, this is not the place to go. Dallas is trying to avoid doing that so it can sustain a supporting cast around him, which is not necessarily a bad thing so long as Anthony remains on board. But for the sake of adjusting to the new labor deal’s harsher penalties for high-spending teams, Cuban’s strategy in breaking up his 2011 NBA championship team did not yield short-term benefits. Outlook: The Mavericks were unsuccessful with their pitches to Deron Williams and Howard, and it appears that might apply to Anthony. Even when accounting for a competitive Western Conference, however, joining the Mavericks would yield the least risk considering it already has their pieces in place. Pro: The Lakers have plenty of selling points beyond pointing to their 16 NBA championships. Anthony can receive a max contract here. He can team with Kobe Bryant, whose strong friendship could help them overcome any hiccups sharing the ball. If Anthony overlooks the lack of a head coach and a barren roster, it appears plausible his signing will spur Pau Gasol to stay. Oh yeah, and there is Los Angeles itself. Anthony can enjoy the comforts of living in his home that he owns here, while he and his wife, La La, can tap into various marketing opportunities. Con: Who will the Lakers hire as their next coach? How will the Lakers have any more room in cap space to fill out the rest of the Lakers’ roster? Will Bryant and Steve Nash actually stay healthy? After coming off their worst season in L.A. franchise history, how long will it take for a rebuild to last? All of these unanswered questions could scare Anthony away. Outlook: Plenty of the Lakers’ potential problems significantly decrease with Anthony’s signing. But that will require both Anthony’s belief in their vision and patience for a short-term rebuild. Pro: The Knicks do not need to worry about whether they can show Anthony the money. Anthony would earn $129.1 million over five years with the Knicks, while making up to $95.9 million over four years. Those terms can be made up, but it at least offers security for a 12-year NBA veteran. It also appears Knicks president Phil Jackson and coach Derek Fisher offer a strong vision in their rebuilding, even if both of them lack experience in their respective position. Con: The Knicks are saddled with too many bad contracts. Even if Jackson and Fisher have strong credentials as a former coach and player, they have not yet proven themselves in their new field. Even if their vision plays out, this could require Anthony to have more patience before enjoying championship success. Outlook: Anthony likely will experience less turmoil in New York than he did his first four years here. While it appears Anthony likes Jackson’s vision, that may not be enough to clean up the Knicks’ mess. NBA free agency: Could Lakers’ persistence on LeBron James & Carmelo Anthony pay off? Lakers meet with Carmelo Anthony, but will they meet with LeBron James?